Every year national and international tourists flock to the southwest coast of Turkey to jump on a legendary ​Blue Cruise​ along the beautiful Mediterranean Sea. Customize your cruise with a private yacht charter or skip the planning and book a standard cabin charter which offers many options for 4 to 8 day itineraries with all food included, and stops at bays, coves and caves of outstanding natural beauty. A wide range of options are available with various routes departing from stunning locations along Turkey’s much loved Turquoise Coast. Bodrum is one of the main departure and arrival towns for the Blue Cruise. Known as the party city of the southwest coast, a couple of days here will be an ideal way to celebrate after leaving your wooden gulet. Alternatively beginning your vacation in Bodrum will make you ready for the tranquility of the open sea. Said to have ‘more bars than beds’ this popular resort town is one of Turkey’s top destinations. Halikarnas is the largest and most famous club in the town but the Cretan style streets in the town center host plenty of alternative clubs and Golturkbuku is a district popular with holidaying Turks. Although for party goers the highlight of Bodrum will certainly be taking the late night catamaran to party till sunrise at the bay’s floating club. Greek Dodecanese Islands. Kos, Rhodes, Samos, Leros and Symi are some of the most frequently visited of the islands, where you can see a awe inspiring mix of ancient history, modern Greek culture and of course unlimited swimming and snorkeling spots. In the center of the Turquoise coast is the bustling town of Fethiye, home to a gorgeous bay that is scattered with small, sugar lump islands and a thickly forested peninsula which boasts quiet coves and sparkling beach clubs. Fethiye has a little something for everyone, with daily boat trips to the surrounding islands, a quirky old town which is great for shopping and people watching by day and partying by night. Wander through the cobbles stone streets lined with traditional Turkish houses and stop by the fish market where you can pick your fish from the daily catch and have it grilled for you in a nearby restaurant. Fethiye also offers lots to do outside the city, and just a short bus ride can take you to the Ghost Town of Kayakoy or the famous Blue Lagoon nature reserve at Oludeniz, where a near constant stream of paragliders float above the sandy beach. Blue Cruises depart from Fethiye most days and usually stop at St Nicholas Island and the exquisite Butterfly valley among other locations. Kas is a modern fishing town built upon the ruins of an ancient Greek city, today all that remains is a small amphitheater on the edge of town. The nearby sites more than make up for this. Located in the center of the Lycian Way, 500 kilometer hiking trail, there are plenty of ancient sights within a few hours walk of the town. Joining the Blue Cruise here means that you will be sure to visit the specially protected region of Kekova, which hosts some of the most incredible bays and spectacular sunset points of the entire southwestern coastline. You will also get the chance to see the Sunken City which lies beneath the crystal clear water in Gokkaya bay. Swimming is not permitted at the ruins but there are plenty of other superb spots to take a dip around the picturesque harbor of Kas. 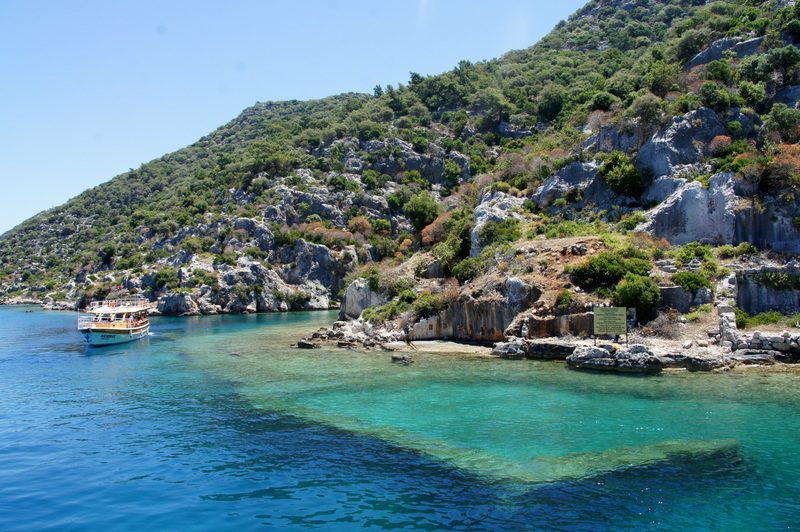 The ​Olympos to Fethiye gulet cruise​ is the most popular of all Blue Cruise routes. Usually 4 days/3 night it’s the perfect length for most holiday itineraries but more importantly it departs from one of the most stunning locations in southwest Turkey. 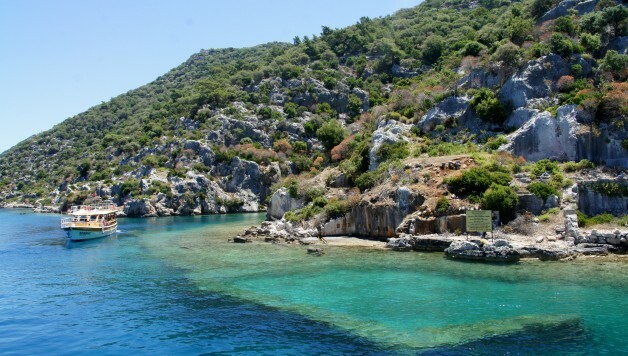 Olympos sits at the base of a valley with ancient ruins occupying either side of a quaint, emerald green river. Traditional restaurants and quirky tree house accommodation occupy one side of the river and this tiny village turns into a top party spot during the hot summer weekends. Following the river to the sea you can choose to paddle in the fresh water or dive into the perfectly clear sea under the shade of looming cliff faces and the Tahtali Mountain which casts shadows over the beach. Before hopping on your Blue Cruise you could spend a day or two exploring the marked hiking trails to secluded beaches and hidden ruins around Olympos or take a kayak out to the small caves around the bay.